The next few blogs will be short with just a few pieces of encouragement for making life at home with littles...well, maybe a little "brighter." I know it's hard to stay at home with your kids and I know it's hard having little kids but there are a few things I've learned along the way. So first let's tackle housework. Mopping. Keeping your kitchen sink clean. Washing dishes & unloading the dishwasher. Oye vey. 1. Buy a candle you love and burn it when you clean. My personal recommendation: Volcano from Anthropologie. Ask your hubby to pick it up instead of flowers next time he's in the mood. 2. Splurge Invest in cleaning products you enjoy. Maybe it's just me but something that smells good and looks good will probably end up in my shopping cart at Target. Lately I've been enjoying the Method products, like cleaning spray and hand soap. Below is my current favorite. You'll find that it's a few cents more than the boring stuff but well worth the motivation. Orla Kiely for Method - cute! 3. I swear I do enough laundry to employ a full-time maid. I often have to re-wash a cycle (or at least put it through rinse again with fabric softener) because it sits in my washer a little too long. 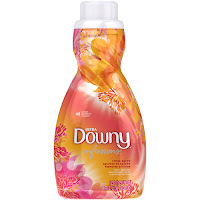 Done with a little Downy Infusions (seen below in Citrus Spice) and my job gets a little more delightful. It makes me happy just thinking about it. Now this isn't a blog about saving money or going green. I'm not going to tell you to get over your boredom/frustration/exhaustion and just do your work. I'm just going to tell you that there are a few practical things out there that can help us find a little joy in the mundane things we do around the house. Love this post! And I just may have to take a stroll down the cleaning aisle at Target for some fresh inspiration.